Im Juli habe ich während meines USA Aufenthaltes ein wenig recherchiert, wo ich denn in der San Francisco Bay Area am besten gute Limonaden kaufen kann. 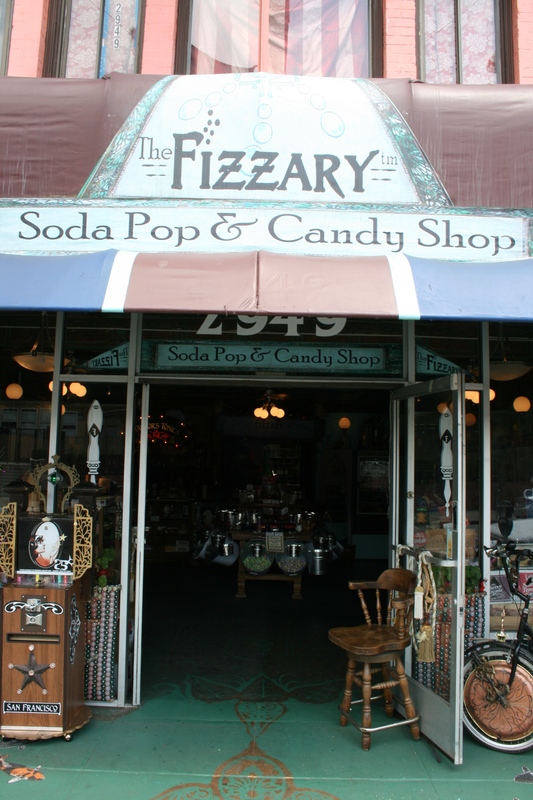 Bei meiner Suche stieß ich auf einen kleinen Laden im Mission District von San Francisco mit dem Namen „The Fizzary„. Die Informationen auf der Website klangen vielversprechend und so entschloss ich mich auf den Weg in die Mission zu machen, mir einen Burrito zu gönnen und der Fizzary einen Besuch abzustatten. Ich wurde nicht enttäuscht. Weder vom Burrito noch von der Limonadenauswahl dieses kleinen Geschäftes. Das Ladengeschäft ist klein, vielleicht 30qm groß und von Wand zu Wand zugestellt mit Limonaden. Ich hatte Schwierigkeiten damit, mich zu entscheiden, wo ich anfangen wollte zu gucken, da die Vielfalt für die Größe des Raumes schier Unendlich wirkte. Alles war übersichtlich in Kategorien (Ginger Ale und -beer, Root Beer, Cola, Fruit Soda etc.) unterteilt und in kompakten Regalen untergebracht. Die Populärsten Limonaden waren ausserdem in Kühlschränken einsortiert, damit sie gleich nach dem Bezahlen genossen werden konnten. Aber selbst wenn man ein Getränk aussuchte, was nicht gekühlt war und im Sommer in einem unklimatisierten Raum eine recht hohe temperatur hatte, war das kein Grund sich zu sorgen, dass man nun ein warmes Getränk herunterwürgen muss. In der Ecke bei den Kühlschränken befindet sich der „Rapid Chiller“ ein Fass, in dem sich eine -40 grad Celsius kalte Flüssigkeit befand, in die man seine Flasche für ca. 3-5 Minuten stellen konnte um sie danach perfekt temperiert zu genießen. Neben hunderten Limonaden werden in dem Geschäft auch noch amerikanische Süßigkeitenklassiker und Kaugummis sowie handgemachte Salt Water Taffys angeboten. Von der Einrichtung erinnert der Laden an eine altmodische, steampunkig eingerichtete Apotheke. Ich habe mich nach meinem ersten Besuch noch einmal mit Aaron vom Fizzary Team im Laden getroffen, um ein kleines Interview mit ihm für den Blog zu führen. In dem sehr informativen Gespräch unterhielten wir uns u.A. über die Geschichte von Soft Drinks, wie es ist, seine eigene Limonade herzustellen und darüber, wie sich die Demographie von Limonadentrinkern über die Zeit hin langsam ändert. An dieser Stelle noch einmal vielen Dank an Aaron & Taylor von Taylor’s Tonics und dem Fizzary Team für einen interessanten Nachmittag und die Zeit für das Interview. Das Interview habe ich transkribiert und in der Originalsprache belassen, da durch Übersetzungen meiner Meinung nach oft viel verloren geht. Ausserdem plane ich, meine Reviews in naher Zukunft auch auf englische Sprache umzustellen. Was haltet Ihr von diesem Plan? Schreibt eure Meinung gern in den Kommentaren! Jetzt aber zum Interview, direkt nach der englischen Einleitung. Last year in July, while I was in the Bay Area, I did a little bit research on where there would be a good source for buying quality sodas. I stumbled upon this small store in Mission District, San Francisco, called „The Fizzary“. The information on their website sounded really promising and so I decided to give it a try. Also, a visit to the Mission is always a good thing. I took BART to Mission Street, had a burrito and went on to my first visit of the Fizzary. It was well worth it. The store is, with about 320 sq ft, pretty small and stuffed with sodas from wall to wall. I had a hard time deciding, where I should start looking because there was a sheer never-ending variety of small, colorful glass-bottles. Everything was clearly organized in different categories (i.e. ginger ale and – beer, root beer, fruit soda, cola etc. ), sitting on compact shelves. There were also a few fridges, which held the most popular sodas, so that they could be enjoyed right away on the go in perfect drinking temperature. If you are craving for another beverage, which they don’t offer in refrigerated form, there is no reason to worry either. This is where their „Rapid Chiller“ comes into play. An amazing construction in form of a keg that holds a -40 degree Celsius liquid which chills your drink handily down to drinking temperature in a matter of minutes. Besides hundreds of bubbly beverages, the Fizzary also offers a wide range of traditional american sweets and hand-made salt water taffies. After my first visit I decided to ask the people who run the Fizzary if they might be interested in doing an interview with me for the blog. About a week later, I met up with Aaron from the Fizzary team in the store and we talked, among others, about the history of soft drinks, how it feels to have your own little soda company (Taylor’s Tonics) and soda store and how the demography of the soda drinker has changed over time. 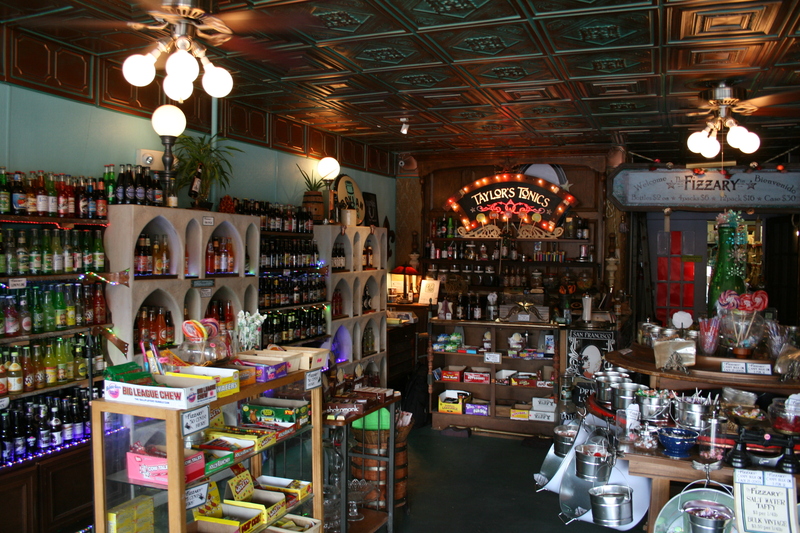 If you want to visit the stores, which I highly recommend, if you have the opportunity, The Fizzary, Soda pop and Candy Shop have now two locations in San Francisco at 2949 Mission Street and 1728 Upper Haight Street. I want to say thank you to Aaron & Taylor from Taylor’s Tonics and the Fizzary Team for a really interesting afternoon and for making some time in their busy schedule for this interview! Christopher: Please tell me a little bit about yourself and about how you got the idea of making a living out of soda. Aaron: My name is Aaron, I am from Fort Worth, Texas, originally. I’ve been in the organic industry for the past 20 years and I’ve been working making beverages for the past 10 years off and on. For a long time I actually bottled raw juice at the last raw juice factory in the country, in Eugene, Oregon. And during that time I bottled their tonics, their flavors of fruit juice that they have added herbal and homeopathic ingredients. At the time I was also studying homeopathy with a few students of homeopathy. ((A boy enters the store and tries to sell candy bars) Hey buddy, you came in a candy store and you’re selling candy (laughs gently). Good luck with that! But feel free to grab a piece of taffy.) Yeah, so basically, for the past five years I started working with Taylor. Taylor had been making chai tea concentrates for the past sixteen years and when we met up we decided to start a new project together and we started the Chai Cola. We’ve had to move it around from factory to factory. Basically what happens in this country is, when you make soda you have to work with a lot of beer manufacturers, because the glass bottle industry is more geared towards alcohol. Part of why you find a lot of root beers, for instance, is because that’s usually the soda that they make at beer breweries [to go] alongside selling beer. So we worked with quite a few different packaging companies that bottled beer and we ended up finally with a company that bottles just soda and they bottle for quite a few other soda companies. We luckily came on to them and it’s been pretty steady for a while just bottling with the same company and being able to create new flavors and come up with new concepts. Typically Taylor and I brainstorm. He’s kind of the mastermind behind the actual formulation. I’m kind of the behind the scenes person who knows the herbal, kind of healthy ingredients to add to the soda to make it a little bit more approachable for the people who are organic buyers, or people who maybe don’t drink soda normally. But they will drink tea. And so we turn on a lot of people who stopped drinking soda because we use tea. And they’ll say, “well, I drink tea at home, so I feel comfortably drinking your soda, because it is made from whole ingredients and tea.” Which the Taylor’s Tonics brand is all made from. Whole ingredients. Including our seasonal flavors we make from whole ingredients. Our holiday flavors, like Candy Cane is made from peppermint tea. The Cranberry is made from Cranberry and Douglas fir. Eggnog is made from nutmeg and cinnamon and other flavors. Aaron: Mate Mojito, which we will have soon. That would be another good one for you to review. Just because it’s really interesting. Christopher: Yeah. It sounds really interesting and pretty exotic. How do you come up with the different flavors? Aaron: We definitely look at features and flavors that are kind of taking off in the foodie culture for instance. The soda that I just gave to you, the Café Azteca – chocolate, ceyenne, are definitely very popular right now in American culture. A lot of that is from Hispanic or Latino culture, taking prominence in this country. The Mojito as well is a Cuban flavor. It’s usually a mix drink, sold on the islands of the Caribbean. We also wanted to provide flavors that are alcoholic typically. We have the Mojito and the Colada, that are non-alcoholic, made from tea, that someone who maybe doesn’t drink alcohol can feel like they’re holding a beer in their hand, but it’s a non-alcoholic – alcoholic based – concept. The flavors come from that as well. So that’s kind of where we come from the flavors. I have an anthropology degree. I got into studying human futures of what humans are kind of headed towards as far as the future is concerned and I kind of apply that personally. I think Taylor also has a very developed palette. As business partners we do great on that level. It’s nice that we can bounce ideas off each other as far as flavor spectrums and futures of flavors are concerned. Christopher: When did your store open? I read somewhere that you did a Kickstarter-Campaign of some sorts? Aaron: We actually never started our Kickstarter. We just advertised it. The store’s been self-funded. Our entire business has pretty much been self funded. We came up with the idea for the store and we wanted to create a safe space for a lot of these glass companies. In the 1980s and 90s it was all about convenience and putting out packaging. Honestly, a lot of packaging like plastics and aluminum, which aren’t really recyclable, aren’t really healthy for the environment. As we know, plastics and aluminum leeches into the water and the products you’re drinking. If you were to say littered glass, even, it would be healthier for the environment then say plastic or aluminum is. So it’s really important to us to support other glass bottle sodas. Especially now that foodie culture has taken off, people are really going towards soda as a luxury item and also the flavor. 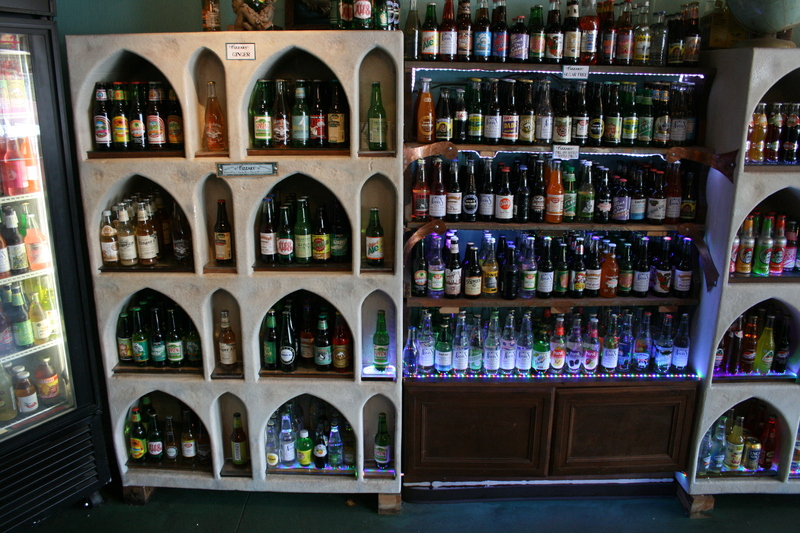 We have about 70 different root beers and 60 different flavors of ginger ale and ginger beer. It gives people more variety than he regular American grocery store would give. Which is typically the two top selling products, which you know is Coke and Pepsi. I sell Coke and Pepsi. The cane sugar versions, which has become very popular in America recently. I’d say 70% of the products [we sell] are made with cane sugar, some of them are made with processed sugar and there’s a handful of things that are just nostalgic brands that are made with corn syrup. We definitely have a fan-base for those products as well. I personally prefer within my own product to go as natural as possible, but I think people are really looking for those memories and I don’t want to take those memories away from them. When they come in the store they are looking for nostalgia. Or they’re looking for a new nostalgia. They are in for something like a new enlightenment around a beverage. Because as a culture in America we were robbed of a lot of our diversity as far as beverages are concerned and as far as food is concerned for a long time. Now the foodie culture. People are seeing soda as more of a luxury item is taking off. And I definitely see a boom in the glass bottle soda industry over the next ten years. Christopher: You brew naturally, or how are you brewing? Aaron: We kettle brew at a low temperature, so as to not kill any of the homeopathic, healthy qualities of our sodas. You know, it’s interesting to say we have a soda that’s healthy (laughs). Christopher: I mean, historically sodas were supposed to be medicine. Aaron: Exactly! And that’s where we came from. Me growing up in Texas I grew up with my grandparents and parents telling me about Dr. Pepper having prune juice for instance. And one time Dr. Pepper was an actual medicine. And at one time in America the soda stores were the pharmacies. People were getting their medicine through carbonated beverages. And eventually, as western medicine took over the pharmacies actually had soda shops in them and they were still selling medicinal sodas, but they were also selling American, westernized drugs. The whole pharmacy concept grew out of the tonic industry. Years before they had the actual stores, like we have here, which we are trying to emulate, that whole nostalgic nineteen-hundreds kind of style with our store. Years before that they had travelling salesmen and they sold snake oil and tonics and all these things that can make your hair grow or make you breathe easier. 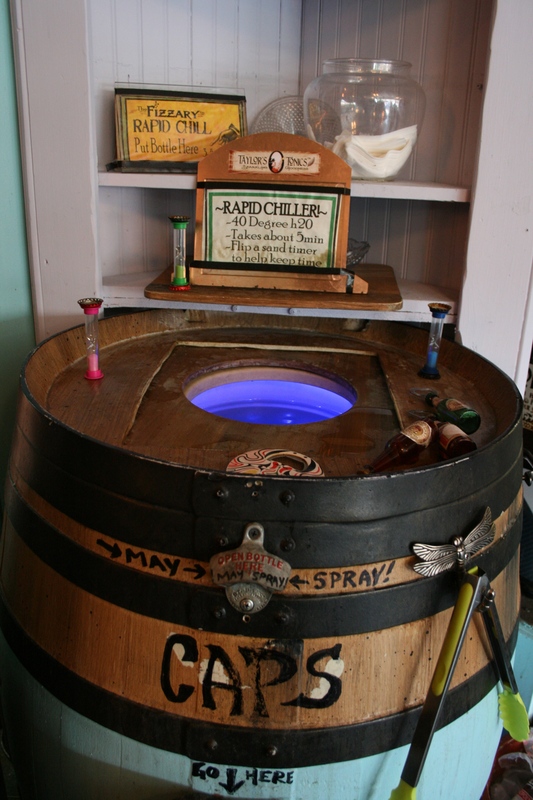 Those were the sodas and they used – there were carbonated springs for instance and they used phosphates. They knew how to mix up tonics that were healthy for you (laughs). But the concept was there. Christopher: Yeah, and you can still taste that it used to be medicine in the old days. For example Moxie, which definitely has a little of that old-fashioned, herby-pharmaceutical taste in the background. Aaron: Exactly. Moxie for instance uses an herb called gentian, which is an anti-depressant. And they kept the same formula since they’ve been created, basically. I believe that the gentian was a lot stronger back in the old days. But that’s the rooty, kind of fennel, kind of liquoricey flavor you get from Moxie, which gives it that unique flavor. Christopher: It’s interesting that today nobody knows that the roots of soda brewing came from a medicinal background and that nowadays nobody believes that sodas can be healthy, as long as you consume it in a reasonable amount. Aaron: Right. And I feel that my customers aren’t the sort of people who drink five sodas a day. I come from Texas. In Texas people drink canned sodas like it’s water. And I’m talking corn syrup and unnatural ingredients. Being here on the west coast, soda is a luxury that people afford themselves. Every once in a while. My customers are probably the people who drink a soda every other day. Or they come in on the weekends with their kids and it’s like going to the ice cream store. It’s a special treat. Sure, I’d love to do higher volumes, but the way that I see it is that it’s quality vs. quantity for people. And people are really looking for quality. We’re coming out of an economic crisis here. And we also have the issue of corn syrup being linked to obesity in this country. And so, when people are putting sugar into their bodies, they are definitely thinking about what are the other ingredients? If I’m going to do something that’s unnatural then why don’t I do something that I actually can choose from this continuing flavor spectrum? In the store we have 700 to 900 types of soda at any given moment. We have anything from a liquorice flavored soda to a bacon-maple soda. So people are kind of going from these odd-ball flavors to butterscotch root beer. Things that are just sort of uniquely American. And with our soda, our personal soda, it’s definitely uniquely American in the way that we see America as a melting pot of different cultures. Chai tea is definitely an Indian culture thing. And the Café Azteca, I got that inspiration from the Aztec, central American culture. The Mojito comes from Cuban culture. The Colada comes from the Caribbean culture. Christopher: One last question – What is Your favorite soda? Aaron: I actually do like Moxie and Cheerwine, which you reviewed. They’re two of my favorites outside of my own sodas (laughs). I really like stuff made by Maine Root. It’s an organic company. The Dry brand sodas and the Gus brand sodas, which are lighter in sugar, are nice because they are more full flavored. But when I’m feeling a little bit more luxurious I’ll go for the Bacon-Maple. There’s a company called “Always ask for Avery’s” – one of the oldest soda companies in this country. It’s been around for 150 years. They make a grapefruit-lemon flavored soda, which I really enjoy because it’s sour. It definitely got that real strong sugary flavor, but it’s a super sour kind of soda. I like that. And I like Leninade, I like things that are kind of funny like that. It’s like joking with Lenin and his communist party and it’s a dark pink lemonade. Christopher: Thanks a lot for your Time! Dieser Beitrag wurde unter Interview abgelegt und mit Classic Soft Drink, Glasflasche, Glass Bottle Soda, Lemonerd, Natural Soda, Soda, Taylor's Tonics, The Fizzary, USA verschlagwortet. Setze ein Lesezeichen auf den Permalink.